The Hillsdale County Courthouse was designed by Claire Allen, a prominent southern Michigan architect. The county is named for its rolling terrain. It was described by action of the Michigan Territorial legislature in 1829, and was organized six years later. See List of Michigan county name etymologies. Hillsdale County was a New England settlement; its early settlers came from the northern coastal colonies – "Yankees", descended from the English Puritans who emigrated from the Old World in the 1600s. There was a wave of such settlers into the Northwest Territory during the early 1800s, many traveling on the newly-completed Erie Canal, and made safe by the conclusion of the Black Hawk War. They brought with them a passion for education, establishing many schools. Many were abolitionists. According to the US Census Bureau, the county has a total area of 607 square miles (1,570 km2), of which 598 square miles (1,550 km2) is land and 8.9 square miles (23 km2) (1.5%) is water.<ref"> "2010 Census Gazetteer Files". US Census Bureau. August 22, 2012. Archived from the original on November 13, 2013. Retrieved September 25, 2014. </ref> Hillsdale is the only county in Michigan to have a land border with two other states – Ohio and Indiana. The headwaters of two St. Joseph Rivers rise in Hillsdale County: the St. Joseph River (Lake Michigan) and the St. Joseph River (Maumee River). Hillsdale County experiences four distinct seasons. July is the hottest month with an average high of 82 °F or 27.8 °C and January the coldest with an average high of 29 °F or −1.7 °C. June is the wettest month with 4.29 inches or 109.0 millimetres of rain on average. As of the 2000 United States Census, there were 46,527 people, 17,335 households, and 12,550 families residing in the county. The population density was 78 people per square mile (30/km²). There were 20,189 housing units at an average density of 34 per square mile (13/km²). The racial makeup of the county was 97.56% White, 0.43% Black or African American, 0.35% Native American, 0.33% Asian, 0.01% Pacific Islander, 0.34% from other races, and 0.98% from two or more races. 1.20% of the population were Hispanic or Latino of any race. 28.4% were of German, 28.2% English and 9.3% Irish ancestry according to 2010 American Community Survey estimate. 97.0% spoke English, 1.2% Spanish and 1.2% German as their first language. The county's population contained 26.30% under the age of 18, 10.00% from 18 to 24, 26.80% from 25 to 44, 23.50% from 45 to 64, and 13.30% who were 65 years of age or older. The median age was 36 years. For every 100 females there were 99.00 males. For every 100 females age 18 and over, there were 96.20 males. Hillsdale County has been reliably Republican since the beginning. Since 1884, the Republican Party nominee has carried 94% of the elections (32 of 34). US 12 crosses the county in a generally east-west direction for a distance of about 23 miles. US 127 is the north-south highway running along a portion of the eastern boundary of the county and is also called Meridian Road as it is along the Michigan meridian. M-34 is a highway from the eastern border of the county westward until it joins highway 99. It is also known as Hudson Road. M-49 is a north-south highway running north from the Ohio border and intersects highway 99 in the northwest corner of the county. Hillsdale Municipal Airport (KJYM) established in 1934, has a 5000' paved and lighted runway with instrument approaches, hangars, tie-downs, and fuel services available. It allows general aviation access to Hillsdale County and nearby areas. The 4000 mile National Scenic North Country Trail passes through the county in a north-south direction. Moses Allen, first settler and veteran of the War of 1812. Oscar F. Avery (1841–1924), lawyer and Illinois state senator, was born in Allen Township. Don A. Jones (1912–2000), admiral and civil engineer, seventh Director of the United States Coast and Geodetic Survey and second Director of the Environmental Science Services Administration Corps, born in Waldron. ^ a b "Bibliography on Hillsdale County". Clarke Historical Library, Central Michigan University. Retrieved January 19, 2013. ^ "Find a County". National Association of Counties. Archived from the original on May 31, 2011. Retrieved July 7, 2011. 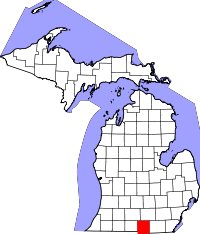 Wikimedia Commons has media related to Hillsdale County, Michigan. "Bibliography on Hillsdale County". Clarke Historical Library, Central Michigan University.